With these old fashioned cherry pie recipes, you're in for a special treat. Cherries have been a favored pie ingredient for generations. Tradition has it that Queen Elizabeth the First made the first cherry pie, but it's quite unlikely that Her Majesty ever visited her royal kitchens. Therefore, its inventor will forever remain unknown. Surprise everyone with a freshly baked, homemade cherry pie. Then, get ready for all the compliments! 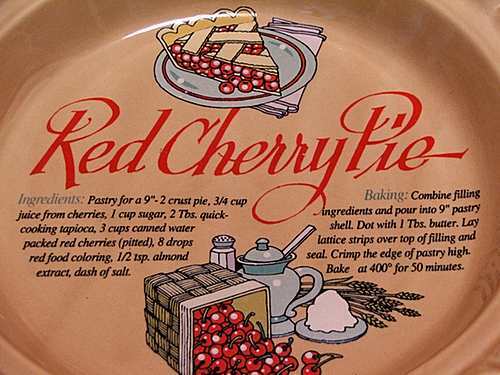 Line a pie plate with rich paste, sprinkle cornstarch lightly over the bottom crust and fill with cherries and regulate the quantity of sugar you scatter over them by their sweetness. Bake with an upper crust, secure the edges well, by spreading the white of an egg all around and pinching firmly together. Eat cold. 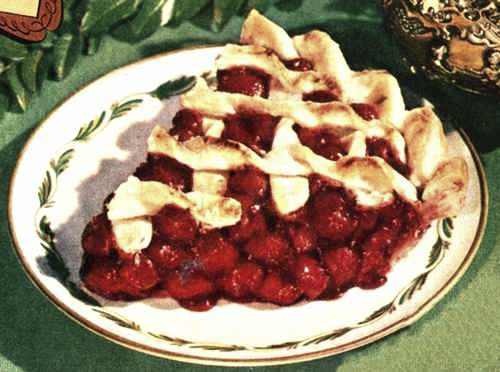 Line your deepish pie plate with good crust, fill half full with ripe cherries; sprinkle over them about a cupful of sugar, a teaspoonful of sifted flour, dot a few bits of butter over that. Now fill the crust full to the top. Cover with upper crust and bake. This is one of the best fruit pie recipes, if made correctly, and the cherries in any case should be stoned. This recipe is one to try when cherries are unavailable, and you have a few cranberries in the cupboard. Imagine: A cranberry pie that tastes as if it were made with cherries!